Ever heard of radishes the weight and size of a watermelon? 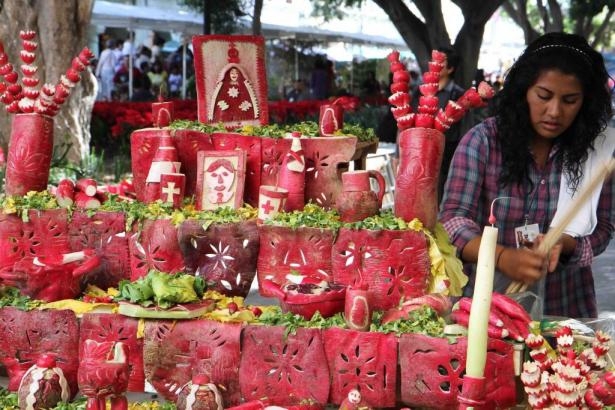 In one Mexican city, carving them is a holiday tradition. 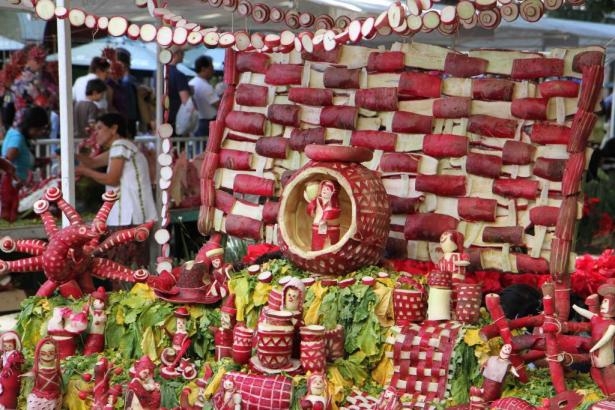 Radish carvings were joined by dried flower and corn husk art at Oaxaca's Night of the Radishes. Photos by David P. Ball. The wee radish is often belittled as a mere side dish, or confined to a supporting role as garnish on salads. 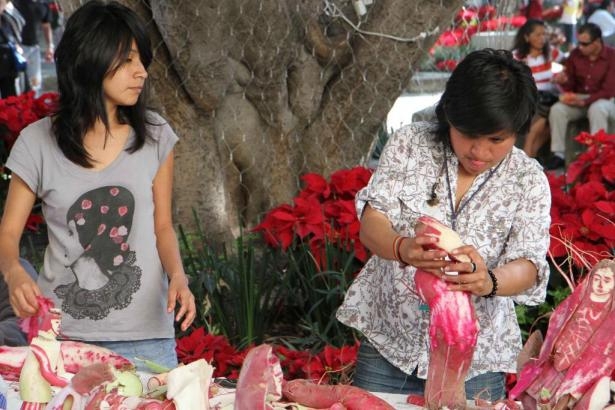 But in the state of Oaxaca, Mexico, the spicy red root vegetable is awarded high status on one night of the year – December 23 – as tens of thousands cram into the city centre of Oaxaca de Juarez for the unique “Noche de rábanos” (Night of the Radishes) festival. 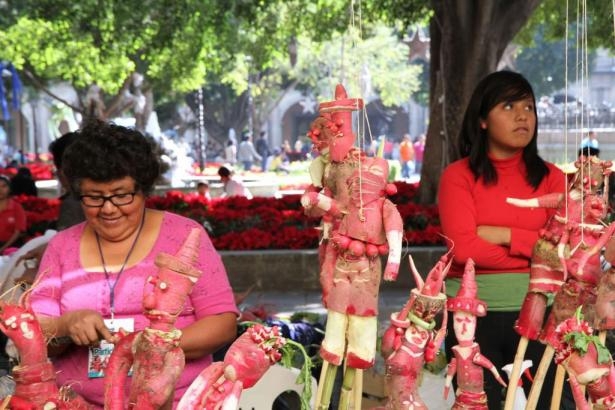 Yesterday, Oaxaca's Plaza Zócalo (city centre square) was occupied by a teeming crowd eager to glimpse exquisitely carved radishes which local farmers grow to monumental sizes – monumental for radishes, that is: up to three kilograms and 50 centimetres long. The radishes are left in the ground long after normal harvesting – attaining extreme sizes and bizarre shapes. 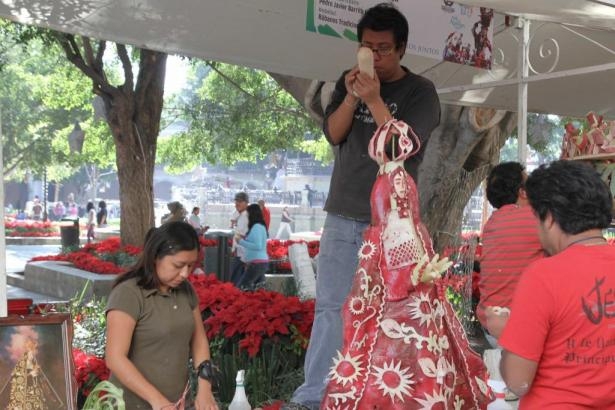 Artisans have competed for a cash prize for the past 113 years, ever since an enterprising mayor, Francisco Vasconcelos Flores, attempted to lift spirits before Christmas in 1897. The prize yesterday's was 15,000 pesos, or roughly CAD $1,100. Needless to say, that buys a lot in Mexico, and the competition between carvers was fierce. 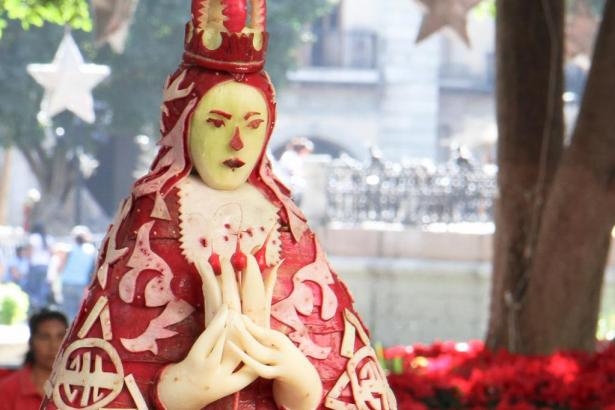 Some sculpted giant radishes into images of the Virgin Mary, while others amalgamated dozens of smaller radishes into historic scenes, building models, and abstract art. 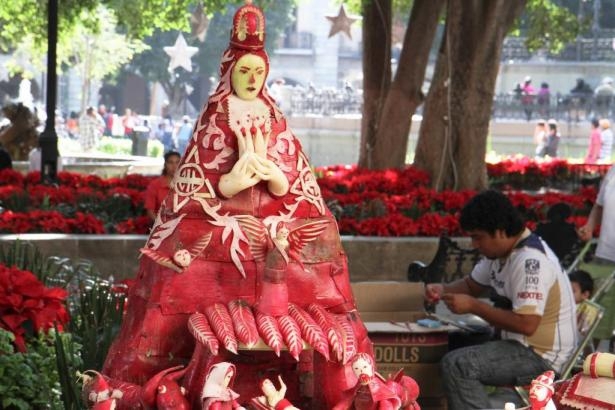 The story of Oaxaca's Night of the Radishes reportedly goes back well before 1897, however. One version of its history suggests that, following the Spanish conquest of Mexico in the 16th century, the colonizing Catholic priests found it difficult to convince local peasants to shop at a market in a new town they had established in the Atoyac River lowlands. 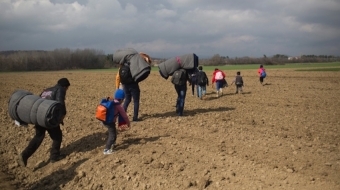 Having convinced locals to farm their imported vegetables, they needed to find them some customers.